As the name suggests, star fruit is a star-shaped tropical fruit characterized by its sweet and sour flavor. The fruit is native to the Malayan peninsula and is grown in many parts of Southeast Asia, Pacific Islands and China. Fresh star fruits are light-green to yellow in color, with a smooth waxy surface. Star fruit, which is also called carambola, is becoming increasingly popular in the West. 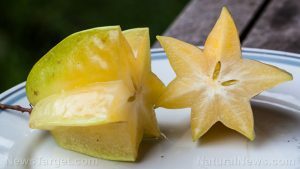 According to AuthorityNutrition.com, star fruit actually has two types: the sweeter and larger variety, and the otherwise smaller and more acidic type. Star fruit is noted for its relatively low glycemic index, which may prevent sudden spikes in blood sugar levels. Foods high in glycemic index — such as white rice and white bread — are known to break down easily and trigger blood sugar and insulin levels to instantly shoot up after meals, followed by a rapid decline in blood glucose rates. In contrast, star fruit is broken down more slowly, which in turn lowers the risk of sugar cravings, sugar crashes, and mood swings. Star fruit is also loaded with potassium, and is relatively low in sodium. Potassium offers a vasodilating effect that relaxes blood vessels and promote proper blood pressure levels. In fact, one cup of star fruit contains 176 milligrams of potassium and only 2.6 mg. of sodium. On the other hand, the fruit’s high fiber and water content promotes satiety and aids in weight loss. Likewise, star fruit’s abundant fiber supply is found to stimulate peristaltic motion and bolster gastric juice secretion. As a result, these effects facilitate digestion and prevent constipation and more serious digestive conditions such as colorectal cancer. The fruit’s high fiber content is also known to eliminate cholesterol from the arteries and blood vessels. In addition, star fruit is a notably rich source of vitamin C. In fact, one cup of starfruit may contain as much as 76 percent of the daily vitamin C requirements. The fruit’s ample vitamin C supply boosts the body’s immune system and wards off infectious agents. Star fruit is also touted to rid the body of cancer-causing free radicals. Additionally, the high vitamin C content in star fruit is found to facilitate collagen and sebum production. Collagen is an essential protein found in the skin and hair, while sebum is an important compound that keeps the hair moisturized. Furthermore, star fruit is an excellent source of magnesium, an essential mineral that improves the quality, duration and tranquility of sleep. The fruit is also found to regulate metabolism, which in turn reduces the risk of sleep disorders such as insomnia. Star fruit significantly supports the digestive, circulatory, and immune systems. The fruit is especially beneficial to the heart, skin, and hair. The fruit’s effects on sleep quality promotes the overall health of the nervous system. Star fruit is primarily used in fruit salads, sweets, and desserts largely due to its citrus-like aroma, and contrasting sweet and mildly sour flavor. The fruit may also be used as a flavoring in a variety of meat dishes. FineCooking.com has listed some interesting meals that contain star fruit. Star fruit prevents diabetes, cancer, and sleep disorders. Star fruit staves off infections and promotes skin and hair health. Star fruit benefits the digestive, circulatory, nervous, and immune systems. Star fruit supports the heart, skin, and hair.